This name uses Spanish naming customs: the first or paternal family name is Contador and the second or maternal family name is Velasco. 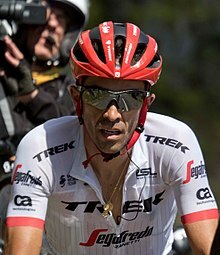 Alberto Contador Velasco (Spanish pronunciation: [alˈβeɾto kontaˈðoɾ βeˈlasko] ; born 6 December 1982) is a Spanish former professional cyclist. He is one of the most successful riders of his era, winning the Tour de France twice (2007, 2009), the Giro d'Italia twice (2008, 2015), and the Vuelta a España three times (2008, 2012, 2014). He is one of only seven riders to have won all three Grand Tours of cycling. He has also won the Velo d'Or a record 4 times. The 2009 Tour de France was the 96th edition of the Tour de France, one of cycling's Grand Tours. It started on 4 July in the principality of Monaco with a 15 kilometres (9.3 mi) individual time trial which included a section of the Circuit de Monaco. The race visited six countries: Monaco, France, Spain, Andorra, Switzerland and Italy, and finished on 26 July on the Champs-Élysées in Paris. Lance Edward Armstrong is an American former professional road racing cyclist, infamous for the biggest doping scandal in cycling history. U.S. Postal Service Pro Cycling Team was a United States-based professional road bicycle racing team. On June 15, 2004, the Discovery Channel signed a deal to become sponsor of the team for the 2004–2007 seasons and its name changed to Discovery Channel Pro Cycling Team From 2005 until 2007, the team was one of the 20 teams that competed in the new UCI ProTour. 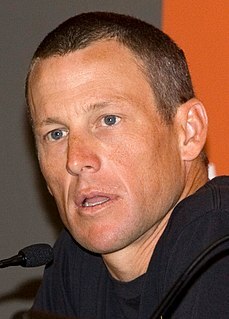 As part of the sponsorship deal, Lance Armstrong, the team's undisputed leader, provided on-air appearances for the Discovery Networks TV channels. The deal did not affect the rights of secondary sponsor OLN, now known as NBC Sports Network in the US, to air major cycling events such as the Tour de France, although the two channels are competitors. The 2008 Giro d'Italia was the 91st running of the Giro d'Italia, one of cycling's Grand Tours. It began in Palermo on 10 May and ended in Milan on 1 June. Twenty-two teams entered the race, which was won by Spaniard Alberto Contador of the Astana cycling team. Second and third respectively were Italians Riccardo Riccò and Marzio Bruseghin. Contador was known as an attacking rider who excelled as a climber, and on his best days was also an excellent time-trialist. He was also known for being able to turn races around to his favour, most notably during the Fuente Dé stage at the 2012 Vuelta a España. Following his return from suspension, he won the Vuelta twice and the Giro once more. On the penultimate day of his career, he won a stage victory at the mountaintop finish of the Alto de l'Angliru. Alto de l'Angliru is a steep mountain road in Asturias, near La Vega-Riosa, in northern Spain. It is considered one of the most demanding climbs in professional road bicycle racing and is often used in the Vuelta a España stage race. Pinto is a municipality belonging to the autonomous community of Madrid, Spain. It has a current population of roughly 51,000 inhabitants and lies on the C-3 Cercanías line connecting it to Aranjuez, Sol and El Escorial. Pinto also has a large park dedicated to the former King of Spain, Juan Carlos I. The Community of Madrid is one of the seventeen autonomous communities of Spain. It is located in the centre of the Iberian Peninsula, and of the Castilian Central Plateau . Its capital is the city of Madrid, which is also the capital of the country. The Community of Madrid is bounded to the south and east by Castilla–La Mancha and to the north and west by Castile and León. It was formally created in 1983, based on the limits of the province of Madrid, which was until then conventionally included in the historical region of New Castile. Cerebral palsy (CP) is a group of permanent movement disorders that appear in early childhood. Signs and symptoms vary among people. Often, symptoms include poor coordination, stiff muscles, weak muscles, and tremors. There may be problems with sensation, vision, hearing, swallowing, and speaking. Often, babies with cerebral palsy do not roll over, sit, crawl or walk as early as other children of their age. Other symptoms include seizures and problems with thinking or reasoning, which each occur in about one third of people with CP. While symptoms may get more noticeable over the first few years of life, underlying problems do not worsen over time. Marco Pantani was an Italian road racing cyclist, widely considered one of the best climbers of all times in professional road bicycle racing. He won both the Tour de France and the Giro d'Italia in 1998, being the sixth Italian after Ottavio Bottecchia, Gino Bartali, Fausto Coppi, Felice Gimondi and Gastone Nencini to win the Tour de France. He is the last cyclist, and one of only seven, to win the Giro and the Tour in the same year. Manuel "Manolo" Saiz Balbás is the former team manager of one of the most successful Spanish professional road bicycle racing teams, first called [[Team ONCE]], then Liberty Seguros-Würth, Astana-Würth, and lastly Astana Team. Contador wearing the yellow jersey during the 19th stage of the 2007 Tour de France. Contador wearing the pink jersey during the 21st stage of the 2008 Giro d'Italia. Contador wearing the golden jersey during the 20th stage of the 2008 Vuelta a España. Contador wearing the yellow jersey leading Andy Schleck at the 2009 Tour de France. On 26 June 2009, Contador competed in the Time Trial of the Spanish National Championships. He stated that he entered the race in order to gain more experience on his new Trek TT bike, but he came away with a convincing victory over Luis León Sánchez, the defending champion, winning by 37 seconds. This was his first National Championship as a professional. Contador wearing the yellow jersey following Andy Schleck on the Col du Tourmalet during the 2010 Tour de France. He was later stripped of this title. Contador in maglia rosa in Milan celebrates victory at 2011 Giro d'Italia. He was later stripped of this title. As his final preparation for the Tour de France, Contador entered the Critérium du Dauphiné where he would duel with Froome and Vincenzo Nibali, his main rivals for the Tour. Contador started the Dauphiné on good form, finishing second to Froome on the race's short individual time trial before dueling with Froome on the Col du Béal. Unlike in 2013 where he was unable to follow the accelerations of Froome, Contador was able to stay on his rival's wheel, eventually finishing second on the stage after Froome outsprinted him to the line. He would have his next duel with Froome on the seventh stage, the queen stage of the race. Contador attacked with two kilometers left on the stage and Froome (who was suffering from the effects of a crash on the previous day's stage) wasn't able to bridge the gap to him as Contador took the yellow jersey as leader of the general classification. However, Contador would fall victim to an ambush on the next stage as several riders in the top ten went into the breakaway including Andrew Talansky, who was just sitting in third place in the GC, 39 seconds behind Contador. Contador was left isolated with no teammates around him as he tried to bridge the gap to the leading group but he ran out of steam as Talansky won the race overall. However, Contador would deal a psychological blow to Froome ahead of the Tour as Froome struggled in the stage, eventually dropping to 12th place overall in the GC. During the 2016 Tour de France it was reported that Contador would race for Trek–Segafredo for the 2017 season,  with the deal being confirmed by the team in September, along with the transfer of teammate Jesús Hernández and Tinkoff directeur sportif Steven de Jongh. This would be his final season as a professional cyclist. In March, Contador missed out on victory in Paris–Nice to a Team Sky by a narrow margin for the second year running after Sergio Henao managed to fend off a final-day attack to win the race by just two seconds. Contador had trailed by 31 seconds overnight, but had gone clear with Quick-Step Floors rider David de la Cruz and Marc Soler of the Movistar Team; after taking a couple of seconds at an intermediate sprint, Contador was beaten to the line in Nice by de la Cruz, which cost him four bonus seconds and decided the race in favour of Henao. Later that month, Contador finished second overall at the 2017 Volta a Catalunya, 63 seconds behind Valverde. In April, Contador finished second overall at the Tour of the Basque Country, again behind Valverde. In July, Contador rode the 2017 Tour de France for the final time, but was unable to challenge for overall victory, finishing ninth overall, 8 minutes and 49 seconds down on the winner, Chris Froome. In August, Contador rode the Vuelta a España, which was to be his final race as a professional. Contador rode an aggressive race in search of a stage victory, placing fifth overall, winning the combativity award in his final Grand Tour, as well as winning the final mountain stage atop the iconic Angliru after attacking on the penultimate climb of the day. Voided results from July 2010 to February 2012. Alejandro Valverde Belmonte is a Spanish road racing cyclist, who currently rides for UCI WorldTeam Movistar Team. Valverde's biggest wins have been the 2009 Vuelta a España, Liège–Bastogne–Liège in 2006, 2008, 2015 and 2017, La Flèche Wallonne, the Clásica de San Sebastián, the 2006 and 2008 UCI ProTours, the 2014 and 2015 UCI World Tours, and the road race in the 2018 World Championships. Janez "Jani" Brajkovič is a racing cyclist from Metlika, Slovenia. He was the world under-23 Time Trial champion in 2004; he rode for the Adria Mobil team and retire in July 2018 after positive anti-doping test. Vincenzo Nibali is an Italian professional road bicycle racer, who currently rides for UCI WorldTeam Bahrain–Merida. Roman Kreuziger is a Czech professional road bicycle racer, who currently rides for UCI WorldTeam Team Dimension Data. Kreuziger is an all-rounder, with climbing and time trial abilities, becoming a contender for the General classification of stage races. He is also considered one of the biggest talents of the sport after winning the 2004 Junior Road World Championships and the 2008 Tour de Suisse at the age of 22. Next year, he won the 2009 Tour de Romandie and in 2013, he was the victor of the Amstel Gold Race. Michele Scarponi was an Italian road bicycle racer, who rode professionally from 2002 until his death in 2017 for the Acqua e Sapone–Cantina Tollo, Domina Vacanze–Elitron, Würth, Acqua & Sapone–Caffè Mokambo, Androni Giocattoli, Lampre–Merida and Astana teams. He was declared the winner of the 2011 Giro d'Italia after the disqualification of Alberto Contador. Other major results of his career were the 2009 Tirreno–Adriatico, the 2011 Volta a Catalunya and the 2011 Giro del Trentino stage races. Joaquim Rodríguez Oliver is a former Spanish professional road racing cyclist, who competed between 2001 and 2016 for the ONCE–Eroski, Saunier Duval–Prodir, Caisse d'Epargne and Team Katusha teams. The 2008 Vuelta a España was the 63rd edition of the Vuelta a España, one of cycling's Grand Tours. The race began with a 7 km (4.3 mi) team time trial on 30 August in Granada. The Vuelta came to a close twenty-three days later with a 102.2 km (63.5 mi) flat stage, which brought the peloton into the streets of Madrid. Nineteen teams entered the race, which was won by the Spaniard Alberto Contador of Astana. Second and third respectively were the American Levi Leipheimer of Astana and the Spanish Carlos Sastre of CSC–Saxo Bank. Christopher Clive Froome, is a British road racing cyclist, who currently rides for UCI WorldTeam Team Sky. Considered by many as one of the greatest stage racing cyclists of all time, he is one of the most successful riders in the history of the Tour de France, having won it four times – in 2013, 2015, 2016 and 2017, with a further two podium appearances in 2012 and 2018. He has also been successful in time trials, including two Olympic and one World Championship bronze medals. Jakob Diemer Fuglsang is a Swiss-born Danish professional road racing cyclist, who currently rides for UCI WorldTeam Astana. Before turning professional for Team Saxo Bank, he was a mountain biker racing for Team Cannondale–Vredestein, winning the Under-23 World Cup and Under-23 World Championships. The 2010 season for the Astana cycling team began in January with the Tour Down Under and ended in October at the Giro di Lombardia. As a UCI ProTour team, they were automatically invited and obligated to send a squad to every ProTour event. The 2013 Tour de France was the 100th edition of the Tour de France, one of cycling's Grand Tours. It started on the island of Corsica on 30 June and finished on the Champs-Élysées in Paris on 21 July. The Tour consisted of twenty-one race stages and covered a total distance of 3,403.5 km (2,115 mi). The race was won by Chris Froome of Team Sky. Second and third respectively were Nairo Quintana and the Team Katusha rider, Joaquim Rodríguez. Richard Julian Porte is an Australian professional road bicycle racer, who currently rides for UCI WorldTeam Trek–Segafredo. He is a two-time winner of Paris–Nice. Thibaut Pinot is a French professional road bicycle racer, who currently rides for UCI WorldTeam Groupama–FDJ. Considered one of the most promising talents in French cycling, he ended third overall in the 2014 Tour de France and first in the young rider classification. He has won stages in all three Grand Tours, with 2 in the Tour de France, 1 in the Giro d'Italia and 2 in the Vuelta a España. Pinot has also won the Giro di Lombardia in 2018 and finished 3rd in the race in 2015. Sergio Luis Henao Montoya is a Colombian racing cyclist, who currently rides for UCI WorldTeam UAE Team Emirates. Mikel Landa Meana is a professional Spanish road cyclist, who currently rides for UCI WorldTeam Movistar Team. Nairo Alexander Quintana Rojas, ODB, is a Colombian racing cyclist, who currently rides for UCI WorldTeam Movistar Team. Tom DumoulinOON is a Dutch professional road bicycle racer, who currently rides for UCI WorldTeam Team Sunweb. Fabio Aru is an Italian professional road bicycle racer, who currently rides for UCI WorldTeam UAE Team Emirates. The 2014 Vuelta a España took place between 23 August and 14 September 2014 and was the 69th edition of the race. It featured eight mountain stages, five hill stages, five flat stages, and three time trials, two of which appeared at the beginning and end of the race. Jerez de la Frontera, on the Spanish south coast, hosted the opening stage. The Vuelta then went counterclockwise, through the south-east and east of the country before crossing the north and finishing in Santiago de Compostela. This was the first time in 21 years that the race has finished outside Madrid. The 2015 season for Team Sky began in January at the Tour Down Under. 1 2 "CAS sanctions Contador with two-year ban in clenbutorol case". Cycling News. Future Publishing Limited. 6 February 2012. Retrieved 6 February 2012. ↑ "Alberto Contador found guilty of an anti-doping rule violation by the Court of Arbitration for Sport (CAS): suspension of two years" (PDF). The Court of Arbitration for Sport. 6 February 2012. Archived from the original (PDF) on 26 February 2012. Retrieved 13 February 2011. 1 2 3 "Alberto Contador Biography". albertocontador.es. Archived from the original on 29 May 2009. Retrieved 18 May 2009. ↑ "Talento y sacrificio para llegar a lo más alto" (in Spanish). El Diario. 10 August 2007. Retrieved 18 May 2009. 1 2 "Past Highlights & Podiums". Astana Team. Archived from the original on 31 July 2008. Retrieved 18 May 2009. ↑ "Contador calm and confident ahead of CAS hearing". Cyclingnews. Future Publishing Limited. 5 November 2011. Retrieved 5 November 2011. ↑ "Alberto Contador – Happy Just To Be Alive!". 23 October 2008. Archived from the original on 17 July 2009. Retrieved 22 May 2009. ↑ "Spanish Fiestas:Alberto Contador". Spanish Fiestas. Retrieved 22 May 2009. ↑ Fotheringham, Alasdair (18 April 2018). "Alberto Contador: The five races that changed my life". cyclingnews.com. Retrieved 18 April 2018. ↑ Fotheringham, Alasdair (23 September 2008). "Tour of Spain winner Contador is world's top stage racer". Universal Sports via Reuters. Archived from the original on 13 February 2012. Retrieved 24 December 2011. ↑ Speck, Ivan (29 July 2007). "Courageous Contador can lift the cloud". Daily Mail. UK. Retrieved 24 May 2009. 1 2 McRae, Donald (16 November 2015). "Alberto Contador: 'It would be perfect to win the Tour, do the Olympics and end'". theguardian.com . Retrieved 16 November 2015. 1 2 Clemitson, Suze (5 November 2015). "P Is For Peloton: The A-Z Of Cycling". theguardian.com . Retrieved 5 November 2015. ↑ "Alberto Contador: Rider Profile". Cycling Weekly. 27 October 2008. Retrieved 18 May 2009. 1 2 Tan, Anthony (17 August 2006). "Former Liberty five: 2/5 cleared". Cyclingnews. Retrieved 18 May 2009. ↑ Jones, Jeff (11 August 2006). "Contador crashes". Cyclingnews. Retrieved 18 May 2009. ↑ Stokes, Shane (15 January 2007). "Contador signs with Discovery Channel". Cyclingnews. Retrieved 18 May 2009. ↑ Quénet, Jean-François (18 February 2007). "Alberto Contador on Miguel Indurain's path". Cyclingnews. Retrieved 18 May 2009. ↑ Brown, Gregor (22 July 2007). "Rasmussen takes control of the Tour". Cyclingnews. Retrieved 18 May 2009. ↑ "The Rasmussen schandal". NRC Handelsblad. 6 January 2009. Archived from the original on 10 July 2009. Retrieved 20 May 2009. ↑ Brown, Gregor (26 July 2007). "'Benna' blasts to first Tour stage win in Castelsarrasin". Cyclingnews. Retrieved 18 May 2009. ↑ Brown, Gregor (28 July 2007). "Kid Contador conquers Tour de France". Cyclingnews. Retrieved 18 May 2009. ↑ "Contador:Another Victory For Discovery". Letour.fr. 29 July 2007. Archived from the original on 8 June 2009. Retrieved 18 May 2009. ↑ Hood, Andrew (23 October 2007). "Contador confirms with Astana". VeloNews. Archived from the original on 25 October 2007. Retrieved 23 October 2007. ↑ Haake, Bjorn (13 February 2008). "Alberto Contador may not be able to defend Tour de France title". Cyclingnews. Retrieved 13 February 2008. ↑ Hood, Andrew (9 May 2008). "Contador: from the beach to the Giro". VeloNews. Archived from the original on 24 July 2008. Retrieved 18 May 2009. 1 2 "Vuelta a España – Contador plays down favourite tag". uk.eurosport.yahoo.com. 29 August 2008. Archived from the original on 7 September 2008. Retrieved 21 September 2008. ↑ "Cycling – Men's Road Race Final Results". The Official Website of the Beijing 2008 Olympic Games. 9 August 2008. Archived from the original on 24 December 2008. Retrieved 18 May 2009. ↑ "Cycling – Men's Road Individual Time Trial Final Results". The Official Website of the Beijing 2008 Olympic Games. 9 August 2008. Archived from the original on 2 May 2009. Retrieved 18 May 2009. ↑ ESPN.com news services (24 September 2008). "Contador says Armstrong could pose 'difficult' situation on team". ESPN. Retrieved 18 May 2009. ↑ Brown, Gregor (21 September 2008). "Stage 21 – September 21: San Sebastián de los Reyes – Madrid, 102.2 km". Cyclingnews. Retrieved 21 September 2008. ↑ Birnie, Lionel (21 September 2008). "Contador quickest to complete Grand Tour set". Cycling Weekly. Archived from the original on 24 October 2008. Retrieved 20 May 2009. ↑ "Contador wins Spanish Vuelta; first Spaniard to win cycling's big three". Reuters via ESPN. 21 September 2008. Retrieved 20 May 2009. ↑ Hood, Andrew (20 September 2008). "Leipheimer wins final TT; Contador locks up Vuelta". VeloNews. Archived from the original on 24 September 2008. Retrieved 20 May 2009. ↑ "Contador maintains lead in Vuelta". AP via the Taipei Times. 22 September 2008. Retrieved 20 May 2009. ↑ Farrand, Stephen (26 November 2008). "Contador Wins Velo d'Or Award". Cycling Weekly. Retrieved 18 May 2009. ↑ "Lance Armstrong to return for 2009 Tour de France". Associated Press via the Arizona Republic. 8 September 2008. Retrieved 22 May 2009. ↑ "Bruyneel: Armstrong, Contador will have to work together". ESPN. 2 October 2008. Archived from the original on 4 November 2008. Retrieved 27 November 2008. ↑ "Contador will stay at Astana". VeloNews. 18 October 2008. Archived from the original on 7 December 2008. Retrieved 27 November 2008. ↑ "Cycling and Fame, Life and Death". El Pais. 10 November 2008. Retrieved 22 May 2009. ↑ "Contador opts to miss 2009 Giro". news.bbc.co.uk. 28 October 2008. Archived from the original on 17 December 2008. Retrieved 27 November 2008. ↑ Brown, Gregor (22 February 2009). "Haussler wins final Algarve stage; Contador overall". Cyclingnews. Archived from the original on 24 June 2009. Retrieved 18 May 2009. ↑ Haake, Bjorn (14 March 2009). "Sánchez topples Contador". Cyclingnews. Archived from the original on 24 June 2009. Retrieved 18 May 2009. He said he had a hunger knock in the finale and could not answer the attack of Sánchez. ↑ Quénet, Jean-François (11 June 2009). "Stage 4 – June 10: Bourg-Les-Valence – Valence (ITT), 42.4 km". Cyclingnews. Archived from the original on 19 June 2009. Retrieved 20 June 2009. ↑ Quénet, Jean-François (14 June 2009). "Stage 8 – June 14: Faverges – Grenoble, 146km". Cyclingnews. Archived from the original on 17 June 2009. Retrieved 20 June 2009. ↑ Les Clarke (19 July 2009). "Contador king of Verbier". Cyclingnews. Archived from the original on 20 July 2009. Retrieved 19 July 2009. ↑ "Contador moves closer to Tour win". BBC Sport. 22 July 2009. Archived from the original on 23 July 2009. Retrieved 23 July 2009. ↑ Macur, Juliet (23 July 2009). "Contador Still in the Lead With Time Trial Victory". New York Times. Retrieved 23 July 2009. ↑ "Contador seals 2009 Tour victory". BBC Sport. 26 July 2009. Archived from the original on 27 July 2009. Retrieved 27 July 2009. ↑ "¡¡En París suena el himno danés en honor a Contador!!". Marca. 26 July 2009. Retrieved 26 July 2009. ↑ "Cycling: Contador Tour win celebrated with wrong anthem". Cycling Central. 26 July 2009. Archived from the original on 30 August 2009. Retrieved 27 July 2009. 1 2 "Contador, Armstrong trade barbs after Tour". Associated Press. 15 September 2009. Archived from the original on 4 December 2010. Retrieved 29 July 2009. ↑ Reuters (31 July 2009). "Contador turns down Astana offer, says agent" . Retrieved 1 August 2009. ↑ Andrew Hood (11 August 2009). "Paulinho follows Armstrong to RadioShack; Azevedo new DS". VeloNews. Archived from the original on 15 August 2009. Retrieved 18 August 2009. ↑ AFP (15 August 2009). "Astana intends to enforce Contador's contract". VeloNews. Archived from the original on 18 August 2009. Retrieved 18 August 2009. ↑ Cyclingnews (19 February 2010). "Contador takes control in Malhão". Cyclingnews. Future Publishing Limited. Archived from the original on 19 February 2010. Retrieved 20 February 2010. ↑ Stephen Farrand (21 February 2010). "Contador wins the Volta ao Algarve". Cyclingnews. Future Publishing Limited. Archived from the original on 22 February 2010. Retrieved 21 February 2010. ↑ James Huang (19 February 2010). "Specialized Shiv time trial design possibly banned by UCI". Cyclingnews. Future Publishing Limited. Archived from the original on 22 February 2010. Retrieved 20 February 2010. ↑ "Contador claims second Paris-Nice". BBC Sport. 14 March 2010. Archived from the original on 15 March 2010. Retrieved 14 March 2010. ↑ Glendenning, Barry (19 July 2010). "Tour de France 2010: Stage 15 – live!". The Guardian. UK. Archived from the original on 22 July 2010. Retrieved 19 July 2010. ↑ PA Sport (19 July 2010). "Contador steals lead". Sportal Australia. PA Sport. Archived from the original on 22 July 2010. Retrieved 19 July 2010. ↑ "Alberto Contador: "Today, we could not do like we did in Spa."". Velonation.com. 19 July 2010. Retrieved 30 September 2010. ↑ Phil Liggett and Paul Sherwen (2010). Le Tour De France 2010. World Cycling Productions (DVD). ↑ "Contador seizes Tour de France lead from Schleck". BBC Sport. 19 July 2010. Archived from the original on 22 July 2010. Retrieved 23 July 2010. ↑ Mackey, Robert (19 July 2010). "Contador Apologizes on YouTube". The New York Times. ↑ "Alberto Contador seals third Tour de France victory". BBC Sport. 25 July 2010. Archived from the original on 25 July 2010. Retrieved 25 July 2010. ↑ "Saxo Bank-SunGard Signs Contador's Top Spaniards". Cyclingnews. 12 August 2010. Retrieved 30 September 2010. ↑ "Contador wins Tour of Catalunya". Yahoo! Eurosport . TF1 Group. Reuters. 27 March 2011. Retrieved 27 March 2011. ↑ "Alberto Contador wins Giro d'Italia". The Daily Telegraph. London. 29 May 2011. Retrieved 30 May 2011. ↑ "Alberto Contador wins 2011 Giro d'Italia". BBC Sport. 29 May 2011. Archived from the original on 30 May 2011. Retrieved 30 May 2011. ↑ "Alberto Contador will race in Tour". 12 June 2011. Retrieved 22 July 2011. 1 2 "Hushovd unhappy with delays in Contador doping hearing". velonation. 3 June 2011. ↑ "Alberto Contador optimistic about the Alps". The Times of India. 16 July 2011. Archived from the original on 19 July 2012. Retrieved 24 December 2011. ↑ "Calm before the storm". Cyclingnews. Future Publishing Limited. 21 June 2011. Archived from the original on 30 June 2011. Retrieved 2 July 2011. ↑ "The Tour's highest-ever finish". Cyclingnews. Future Publishing Limited. 19 October 2010. Archived from the original on 30 June 2011. Retrieved 22 July 2011. ↑ "Tour set for thrilling climax as Schleck strips Voeckler of yellow jersey after 19th stage". THE TIMES OF INDIA. London. 22 July 2011. Archived from the original on 24 July 2011. Retrieved 22 July 2011. ↑ Dale Robertson (27 July 2011). "Hincapie, Ochowicz win in supporting roles". Houston Chronicle . Retrieved 28 July 2011. ↑ "Contador returns with Saxo Bank". Cycling News. Future Publishing Limited. 8 June 2012. Retrieved 8 June 2012. ↑ "2012 Eneco Tour results, stage 7". 12 August 2012. ↑ "Saxo Bank-Tinkoff Bank names Alberto Contador's team for Vuelta a España". 12 August 2012. ↑ "Contador: Opportunities exist every day to catch Purito". Velonews.competitor.com. Retrieved 5 September 2012. ↑ Peter Cossins (3 September 2012). "Epic win for Cataldo on Cuitu Negru". Cycling News. Future Publishing Limited. Archived from the original on 3 November 2011. Retrieved 6 September 2012. 1 2 Cycling (5 September 2012). "Alberto Contador leads Vuelta a España after brilliant stage win". London: Telegraph. Retrieved 5 September 2012. ↑ "Menchov prevails on the Bola del Mundo". Cycling News. Future Publishing Limited. 8 September 2012. Archived from the original on 10 September 2012. Retrieved 11 September 2012. ↑ "Alberto Contador wins Vuelta a España for the second time". The Guardian UK. London: 2012 Guardian News and Media Limited. Associated press. 9 September 2012. Retrieved 11 September 2012. ↑ "Contador has lacklustre Worlds time trial". Cycling News. Future Publishing Limited. 20 September 2012. Retrieved 27 September 2012. ↑ Alasdair Fotheringham (22 September 2012). "Spain ready to play various cards at world championship". Cycling News. Future Publishing Limited. Retrieved 27 September 2012. ↑ Daniel Benson (23 September 2012). "UCI Road World Championships 2012: Elite Men road race Results". Cycling News. Future Publishing Limited. Retrieved 16 April 2016. ↑ "Contador wins revived Milano-Torino road race". SportsNet. 2001–2012 Rogers Communications. Associated Press. 26 September 2012. Archived from the original on 5 March 2016. Retrieved 27 September 2012. ↑ "Alberto Contador wraps up camp, sets big goals for 2014". VeloNews. Competitor Group, Inc. 30 November 2013. Retrieved 12 April 2014. ↑ "Contador rules out breaking Saxo Tinkoff contract before end of agreed term". VeloNation. VeloNation LLC. 1 December 2013. Retrieved 12 April 2014. ↑ "Contador wins Algarve stage atop Alto do Malhao". Cyclingnews.com . Future plc. 22 February 2014. Retrieved 23 February 2014. ↑ "Stage 4: Indicatore (Arezzo) to Cittareale (Selva Rotonda)" (PDF). Tirreno–Adriatico . RCS Sport . Retrieved 12 March 2014. ↑ "Stage 5: Amatrice to Guardiagrele" (PDF). Tirreno–Adriatico . RCS Sport . Retrieved 12 March 2014. ↑ "Stage 3: Banyoles to La Molina". Cyclingnews.com . Future plc . Retrieved 24 March 2014. ↑ "Alberto finished second overall in Catalunya". Tinkoff–Saxo . Tinkoff Sport. 30 March 2014. Archived from the original on 2 April 2014. Retrieved 30 March 2014. ↑ Cary, Tom (14 July 2014). "Alberto Contador crashes out as Vincenzo Nibali takes Stage 10 and yellow jersey". The Daily Telegraph. Retrieved 15 July 2014. ↑ "Contador says adios to the Vuelta". pelotonmagazine.com. ↑ "Contador to ride Vuelta, healing faster than expected". pelotonmagazine.com. ↑ Andrew Hood (September 2014). "Alberto Contador drives stake into Vuelta a España". VeloNews. Competitor Group, Inc. Retrieved 8 September 2014. ↑ Peter Cossins (13 September 2014). "Vuelta a España: Contador wins on Ancares". Cyclingnews.com . Future plc . Retrieved 13 September 2014. ↑ "Contador seals overall 2014 Vuelta a España victory". Cyclingnews.com . Future plc. 14 September 2014. Retrieved 14 September 2014. ↑ Andrew Hood (11 September 2014). "Contador defends decision to skip Spanish worlds". VeloNews. Competitor Group, Inc. Retrieved 11 September 2014. ↑ "Alberto Contador: "I withdraw from Beijing to focus on 2015". Tinkoff-Saxo . 2014 Tinkoff Sport A/S. 6 October 2014. Archived from the original on 8 October 2014. Retrieved 6 October 2014. ↑ Andrew Hood (14 February 2015). "Alberto Contador confirms Giro-Tour double … again". VeloNews . Competitor Group, Inc. Retrieved 30 April 2015. ↑ Alasdair Fotheringham (30 April 2015). "Contador moves into Vuelta a Andalucia race lead". Cyclingnews.com . Future plc . Retrieved 30 April 2015. ↑ Richard Windsor (20 February 2015). "Contador wins Ruta del Sol stage three and extends overall lead". Cycling Weekly . IPC Media Sports & Leisure network. Retrieved 20 February 2015. ↑ "Froome seizes overall lead at Vuelta a Andalucia". Cyclingnews.com . Future plc. 21 February 2015. Retrieved 30 April 2015. ↑ Daniel Benson (18 March 2015). "Tirreno-Adriatico: Sagan wins stage 6". Cyclingnews.com . Future plc . Retrieved 30 April 2015. ↑ Alasdair Fotheringham (28 March 2015). "Contador crashes hard at Volta a Catalunya". Cyclingnews.com . Future plc . Retrieved 30 April 2015. ↑ Alasdair Fotheringham (30 April 2015). "Alberto Contador exclusive: Recovered from injury and ready for the Giro d'Italia". Cyclingnews.com . Future plc . Retrieved 30 April 2015. ↑ "Contador ahead of Giro d'Italia rivals in opening TTT skirmish – Cyclingnews.com". ↑ "Contador confirmed to start Giro d'Italia stage 7 – Cyclingnews.com". ↑ "Alberto Contador back in Giro d'Italia lead after crucial time trial – Cycling Weekly". 23 May 2015. ↑ "Alberto Contador reclaims Giro lead from Fabio Aru after time trial". ↑ Emil Axelgaard (26 May 2015). "Amazing Landa makes it two in a row in the queen stage". Cycling Quotes. CyclingQuotes.com 2013. Retrieved 27 May 2015. ↑ "Results-Giro d'Italia". Eurosport . Discovery Communications . Retrieved 30 June 2015. ↑ Gregor Brown (31 May 2015). "This is my third Giro d'Italia win, insists Alberto Contador". Cycling Weekly . IPC Media Sports & Leisure network. Retrieved 1 June 2015. ↑ "Alberto Contador seals Giro d'Italia after Iljo Keisse holds on for final stage victory in Milan". Daily Telegraph. 31 May 2015. Retrieved 4 June 2015. ↑ "Route du Sud win changes nothing, says Contador". Cyclingnews.com . Future plc. 22 June 2015. Retrieved 22 June 2015. ↑ "Classifications". ASO. Retrieved 9 August 2015. ↑ Pretot, Julien (26 July 2015). "Contador double bid fizzles out after Giro exertions". Reuters . Retrieved 7 March 2016. ↑ "Kreuziger replaces sick Contador as captain in Clásica San Sebastián". cyclingnews.com. 30 July 2015. Retrieved 7 March 2016. ↑ Clarke, Stuart (10 March 2015). "Alberto Contador confirms retirement date". Cycling Weekly. Retrieved 7 March 2016. ↑ "Thomas seals consecutive overall Volta a Algarve victories". cyclingnews.com. 22 February 2016. Retrieved 7 March 2016. ↑ Clarke, Stuart (13 March 2016). "Geraint Thomas stages remarkable comeback to hold off Alberto Contador and win Paris-Nice". Cycling Weekly . Retrieved 14 April 2016. ↑ "Volta a Catalunya: Quintana cruises as Tsatevich claims the finale". sbs.com.au . 28 March 2016. Retrieved 14 April 2016. ↑ Martin, Richard (8 April 2016). Ferris, Ken, ed. "Contador to carry on competing in wake of Basque triumph". reuters.com . Retrieved 14 April 2016. ↑ "Alberto Contador withdraws from the Tour de France". theguardian.com . 11 July 2016. Retrieved 15 September 2016. ↑ "Contador wins Vuelta a Burgos title by one second". cyclingnews.com . 6 August 2016. Retrieved 6 August 2016. 1 2 "Alberto Contador will switch to race for Trek-Segafredo in 2017". theguardian.com . 15 September 2016. Retrieved 15 September 2016. ↑ "Contador signs with Trek Segafredo on Tour de France rest day – Cyclingnews.com". ↑ "Team Sky's Sergio Henao wins Paris-Nice by two seconds". BBC Sport . BBC. 12 March 2017. Retrieved 12 March 2017. ↑ Andrew Hood (26 July 2006). "Astana 5' cleared by Spanish courts". VeloNews. ↑ Drap, Rob (8 July 2007). "Now the man they hoped would save the Tour faces a new inquiry into doping allegations". Daily Mail. UK. Retrieved 30 May 2008. ↑ Gutiérrez, Juan (27 July 2007). "El Tour califica a Contador de líder "limpio" y "creíble"" (in Spanish). As.com. Retrieved 30 May 2008. ↑ Johnson, Greg (6 December 2006). "First witnesses testify in Operación Puerto". Cyclingnews. Retrieved 30 May 2008. ↑ "An Interview with Alberto Contador, July 29, 2007". Cyclingnews. 29 July 2007. Retrieved 30 May 2008. ↑ Mandard, Stéphane (28 July 2007). "Alberto Contador, maillot jaune miraculé de l'"opération Puerto"". Le Monde (in French). France. Retrieved 30 May 2008. ↑ Hood, Andrew (26 July 2007). "On the list, off the list – Alberto Contador and Operación Puerto". VeloNews. Archived from the original on 21 March 2008. Retrieved 30 May 2008. ↑ Agence France Presse (31 July 2007). "German drugs expert points finger at Contador". Sydney Morning Herald. Archived from the original on 17 August 2007. Retrieved 31 July 2007. ↑ "Das größte Ding aller Zeiten (The greatest thing of all times)" (in German). ZDF. 30 July 2007. Archived from the original on 4 August 2007. Retrieved 30 July 2007. 1 2 "Expert claims Contador doped". iol.co.za. 1 August 2007. Archived from the original on 17 August 2007. Retrieved 1 August 2007. ↑ "Contador: 'I have never doped'". VeloNews. 10 August 2007. Archived from the original on 28 August 2007. Retrieved 10 August 2007. ↑ "Video – Breaking News Videos from". CNN. Retrieved 30 September 2010. ↑ Weislo, Laura (30 September 2010). "Contador's Contaminated Food: Excuse Or Possibility?". Cyclingnews. Retrieved 30 September 2010. ↑ "BBC Sport – Cycling – Angry cyclist Alberto Contador pleads innocence". BBC News. 30 September 2010. Archived from the original on 1 October 2010. Retrieved 30 September 2010. ↑ "Tour de France winner rejects positive doping test – This Just In – CNN.com Blogs". News.blogs.cnn.com. 30 September 2010. Retrieved 30 September 2010. ↑ "Contador blames contaminated meat – Yahoo! Eurosport". Uk.eurosport.yahoo.com. Archived from the original on 2 October 2010. Retrieved 30 September 2010. ↑ "Blazin' Saddles – Yahoo! Eurosport". Uk.eurosport.yahoo.com. Archived from the original on 5 October 2010. Retrieved 30 September 2010. ↑ "Video – Breaking News Videos from". CNN. Archived from the original on 30 September 2010. Retrieved 30 September 2010. ↑ "Cyclist Alberto Contador blames food contamination for failed steroid test – amFIX – CNN.com Blogs". Amfix.blogs.cnn.com. 30 September 2010. Retrieved 30 September 2010. ↑ "Alberto Contador submits final defence to overturn proposed doping ban". The Guardian. UK. 8 February 2011. Retrieved 24 July 2011. ↑ Macur, Juliet (4 October 2010). "2nd Failed Test Puts Heat on Contador". New York Times. Retrieved 19 February 2011. ↑ "Experts mixed on Alberto Contador's tainted beef defense for positive Clenbuterol test during Tour". Daily News. New York. 1 October 2010. Retrieved 24 July 2011. ↑ "Contador suspended after positive test – Yahoo! Eurosport". Eurosport. Archived from the original on 2 October 2010. Retrieved 30 September 2010. ↑ "Alberto Contador Tests Positive For Clenbuterol". Cyclingnews. 30 September 2010. Archived from the original on 2 October 2010. Retrieved 30 September 2010. ↑ Greg Johnson (30 September 2010). "Alberto Contador Suspended Over Traces of Clenbuterol From Tour De France Test". Cyclingnews. Archived from the original on 3 October 2010. Retrieved 30 September 2010. ↑ "BBC News – Tour de France winner Alberto Contador tests positive". BBC. 30 September 2010. Archived from the original on 30 September 2010. Retrieved 30 September 2010. ↑ Weislo, Laura (30 September 2010). "Contador's scientific expert De Boer details defense". Cyclingnews. ↑ "UCI appeals Contador decision to Court of Arbitration for Sport". Cyclingnews. 24 March 2011. ↑ "Alberto Contador's doping case delayed until November". The Guardian. London. 26 July 2011. Retrieved 27 July 2011. ↑ "Riis continues to support Contador despite ban". Cycling News. Future Publishing Limited. 7 February 2012. Retrieved 7 February 2012. Wikimedia Commons has media related to Alberto Contador . Lance Armstrong has won the award in 1999, 2000, 2001, 2003 and 2004, but his results have been removed due to the doping case.